It has been a year since our herd's one and only boar, the fluffy Peruvian Morry, left to join the other piggies at Rainbow Bridge - taking a piece of our hearts with him. He certainly wasn't the first pig our humans lost, but that didn't make the loss any less difficult to bear. Lesser humans may not understand how any "disposable pocket pet" can mean so much, but whee know that each pig is special, with their respective distinctive personalities. Mannerisms such as chewing on the cage bars to speed up the veggie giving, standing on their hind legs to beg for a treat, or burbling happily during cuddles may be shared across the board, yet each pig still manages to turn it into something uniquely theirs. Morry was always a very friendly, sociable boar - he was never skittish around humans, but rather, went bouncing up to greet them inquisitively. Our humans particularly missed his frequent talking and the way he'd continue wheeking insistently until they gave him a chunk of carrot. Since he was a long haired Peruvian, he spent hours with our girl slave grooming and trimming his fur. Once, she styled his fur longer around his face and shorter everywhere else, so he resembled a lion! Her favorite was how even the fur on his little piggy legs grew long, so when he ran around he looked as if he was wearing pantaloons. He fell in love with Coppy early on and was forever waiting patiently for her on the other side of the cage divider to come up and talk to him. He shared his favorite foods with her, napped snuggled up to her side while she munched on the lawn, sat by quietly while she nibbled on his ear, and even slept next to the divider, happy just to be near her. As time passed, they became quite devoted to each other. Our humans told us they'd often walk past their cage to see Morry and Coppy, sleeping side by side, on opposite sides of the bars. 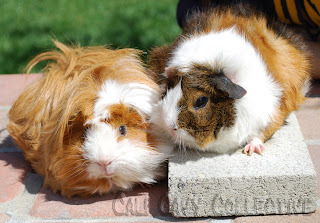 Coppy was never quite the same after he left, no matter how many of us pigs they adopted in his absence in the hopes that she would bond with one of us. 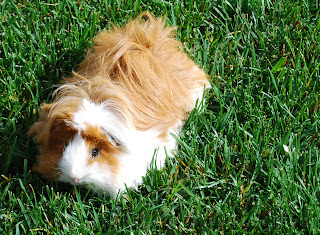 Missing Morry, and all the other beloved pigs and pets whom have left us for Rainbow Bridge. Whee shall never forget you.